In the late 1960s, Walter Mischel conducted a series of experiments with preschoolers at a Stanford University nursery school. 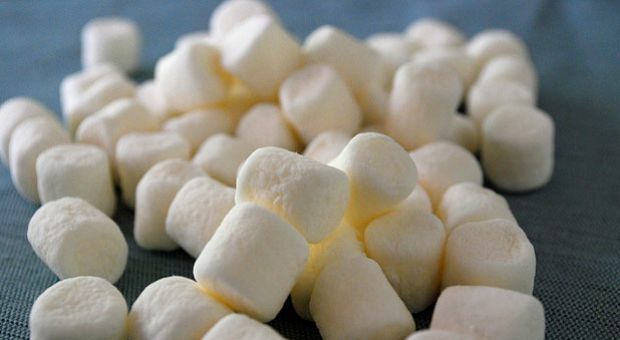 Popularly known as “The Marshmallow Test,” 4 and 5-year-olds were presented with a difficult choice: they could eat one treat immediately or wait several minutes longer to be rewarded with two. Years later, Mischel followed up with children in his original study and discovered a surprising link: The kids who had waited for two treats had higher SAT scores, greater workplace success and a lower body mass index later in life. A leading expert on self-control discusses his famous “Marshmallow Test,” the nature of willpower and implications for public policy. While no videos or photographs exist of the actual Stanford University tests, countless would-be scientists have replicated the experiment. This is a modern-day example of the marshmallow test, run with two hidden cameras. Excerpted from “The Marshmallow Test: Mastering Self-Control” by Walter Mischel. Copyright 2014 Little, Brown and Company. MS. DIANE REHMThanks for joining us. I'm Diane Rehm. In the 1960s, Walter Mischel tested hundreds of preschoolers at Stanford University. In what's become known as the marshmallow test. Mischel discovered that a child's ability to delay gratification had major implications for later success in school, workplace achievement and even mid-life weight gain. In a new book, Walter Mischel writes about his pioneering test and argues that will power can be taught as a cognitive skill, even in adulthood. MS. DIANE REHMThe book is titled, "The Marshmallow Test: Mastering Self-Control." Walter Mischel joins me in the studio. I'm sure many of you have questions. You can join us at 800-433-8850. Send us an email to drshow@wamu.org. Follow us on Facebook or send us a tweet. It's good to meet you, sir. MR. WALTER MISCHELDelighted to be here. REHMThank you. Take us back to your early career as a professor of Psychology at Stanford in the late 1960s. Why did you come up with this, what we now refer to as the marshmallow test? MISCHELIt actually started earlier than that. And it was something that began when I was a graduate student, still at Ohio State University, studying clinical Psychology, which was the area in which I got my Phd. And I was in the Caribbean, particularly on the island of Trinidad, studying some questions that had absolutely nothing to do with marshmallows. But it began when I wanted to test the idea that trust is terribly important in how people make choices between, for example, if they're kids, tiny piece of chocolate that you can have today or a much larger piece that you can have when I come back next week. REHMBut what led you to starting thinking about that? MISCHELIt led me to it because in the village that I was living in in Trinidad, it was one of the dimensions that people naturally talked about when they were comparing themselves to the neighbors who lived on the other side of the road. The two groups that were living there were people who historically, way back, had gotten to Trinidad because they were indentured servants who had come from, this is way back historically, who had come from east India. And the other group, living on the other side, had come, historically again, as slaves from Africa. MISCHELAnd the characterizations of the people who lived quite cordially with each other on two sides of the road in this village were very heavily in terms of who puts the money under the mattress and saves for their children's college, as opposed to who is really out there enjoying the moment and so on. So, the dimension was very clear, to me, that what was very important was a dimension that had been completely unstudied in psychology. Namely, the willingness and ability to delay gratification and to wait for the later rewards, rather than settling for smaller ones. REHMNow, I want to let listeners know that you can see a video of a child taking an example of the marshmallow test. It's not quite exactly as Dr. Mischel did it, but it will give you a sense. So, go to drshow.org and you can actually see what we're talking about. So, between 1968 and 1974, you and your graduate students put together this test. Take me back there and picture it for me. MISCHEL...and what we were doing in Stanford. MISCHEL...have the chocolate mousse -- in my head and being able to deal with it when the thing is stuck right there in front of my eyes and nose. And that in the second situation, where I'm actually in the restaurant and I'm looking at this delicious thing, it too often wound up in my mouth. So I wanted to understand what happens here and what needs to happen when one is confronted, not simply with a choice. Would you like to have the dessert tonight or are you going to skip it? But when one is actually confronted with the temptation, sort of Adam and Eve style, in the Garden of Eden. MISCHELYou know, it strikes me that there may be something else involved here, as well, which is thinking about the chocolate mousse is one thing, is in your brain. Seeing the chocolate mousse may also get the saliva glands working, and that too would be an added burden toward resistance. Am I correct? MISCHELYou are correct. And it doesn't just -- seeing it doesn't just get the saliva going. It gets a part of the brain going and is the basic, most primitive part of the brain, which is often referred to as the limbic system. And it's the lower part of the brain. It's the primitive part of the brain. It's hugely important in fear and in appetite behavior. And it is automatic and reflexive and immediate, so that when one sees a hot temptation, the automatic reflexive tendency is to go for it. MISCHELIn the same way that when one hears a bullet shot, the automatic tendency is to dive under the table. So, both the positive and the negative reflexive reactions are very immediate and very automatic. And quite different from what the more recently in evolutionary time, part of the brain, namely the prefrontal cortex does, which is to allow us to think reflectively, not reflexively. To take the future into account, to realize if I eat this thing now, then later, I will have a bad blood test, a thicker waistline, et cetera. MISCHELAnd that, a great problem for self-control is that the hot part reacts first. And when it reacts, the cool part, the cognitive part, goes down. So, as the hot goes up, the cool goes down. If the cool goes up, the hot goes down. They're in a reciprocal relationship. And there's one more thing to keep in mind here, which is under high stress, the hot system goes up, the cool system goes down. This is hugely important, because lots of human beings live under toxic, chronic stress. In which case, that hot system is operative lots of time. REHMSo, how many of you were involved in the creation of this so-called marshmallow test? MISCHELIt depends on when you're asking -- about what period of time you're asking the question. MISCHELOkay, at the start of the story, which is now Stanford University, the Bing Nursery School, and we're in 1965. At the start of that story, it's a small band. You know, it's myself and perhaps three graduate students. By the time we're in the late 70s and early 80s, the group increases. By the time we're talking about right now, this moment, it's my team and a team, most recently, of economists from Harvard University, who are studying the marshmallow kids from Stanford, who were four and five and three years old when I began with them. MISCHELAnd who are now in their mid-50s. And we're looking at economic outcomes. We're looking at the wealth. We're looking at the credit card default and so on. REHMAnd when you, with your three graduate students, began thinking about how best to present it, there must have been lots of ideas flowing. MISCHELThere were lots of ideas flowing and we tried all kinds of things. But we knew that what we had to do is, first of all, pick something that the particular child really wanted. So, what is called the marshmallow test, very often, children weren't selecting the marshmallows. They had choices from a whole variety of treats. It's also important to understand that before the quote, test, we developed a relationship with the children so that they trusted us, they were familiar with the researchers. MISCHELAnd often easily misunderstood. So the surprise room, into which the child went, after we left the play situation, was a room in which they entered and first had the experience of, again, playing games and so on with the researcher. And then, here's another game. And in this game, we go to the, what's called the waiting square. And the child sits in a chair in the waiting square. And in front of the child is a tray, in which there are not one object, which is how the videos usually show, but three objects. MISCHELAnd the three objects are, if the child has selected, for example, marshmallow rather than little tiny pretzel sticks or colored poker chips or little mints. There are, in front of the child, on the tray, easily visible, directly in front, let's say in the case of marshmallows, one marshmallow on the left and two marshmallows on the right side of the tray. REHMAll right, and I'm going to stop you right there. We'll come back to the presentation after a short break. Stay with us. REHMAnd welcome back. Walter Mischel is with me. His new book -- by the way, David Brooks wrote about the Marshmallow Test back in 2006. Walter Mischel is at Columbia University. His new book is titled "The Marshmallow Test: Mastering Self-Control." And before the break, Walter Mischel, you were in the process of describing those three items that the child saw on a tray. Go on, please. MISCHELRight. So we left the child sitting there staring at three marshmallows, two on the right side, one on the left side. And in addition, the child had a desk bell, the kind of bell that's in a hotel, you know, in the old days at least and you ring the bell. REHMI want to stop you right there. Why one on one side and two on another side? MISCHEL...any time. And all she had to do was either to start eating it or to ring that bell. If she rings the bell the researcher jumps right back in the room. And the child has had experience ringing the bell and knows how to ring the bell. It's the bring-me-back bell. The researcher jumps right back in again solving the trust problem. So the child knows I can bring the researcher right back into the room by ringing the bell or by starting to nibble on the marshmallow, on the one. But if I want those two on the right side of the tray I have to wait for the lady to come back by herself. MISCHELNow, we tried -- and you asked me how did it get developed, we tried to see if we tell the child how much time it'll take, for instance, the lady comes back in 15 minutes, it didn't make any difference. Four- and five-year-olds are not discriminating time yet. So there's no information given by making time judgments. So that's the situation. And the question is, how long does the child wait before either beginning to eat the one marshmallow or ring the bell, and that's the measure. That’s the whole thing. REHMWhy does that tell you something? MISCHELWell, the first thing that we learned about it was that the way in which the children dealt with this delay was enormously informative because we saw the strategies that make willpower, self-control in four- and five-year-old children easy and spontaneous. REHMBut I -- here's what I don't get. Did you say to these children, if you want to eat this marshmallow right now, you can do so or if you wait until that lady comes back in you can instead have two marshmallows. Is that what you did? MISCHELYou sound like you were the researcher. MISCHELThat's exactly what we did. REHMThat's what I wanted to understand. MISCHEL...it's just about verbatim what was said to the child. REHMAnd how many children were you dealing with at this point? MISCHELAt the beginning it was small numbers. MISCHELWell, one at a time, you know. So these children, you know, kept coming and coming and coming. The total that we began with as a sample was something like 550 children. REHMAnd you did it in exactly the same way, one on the left, two on the right or vice versa. You can have this one right now or if you wait until she walks back in the door, you can have two. MISCHELThat was the standard procedure except we also did something which is usually not in the media, which is we did a whole set of experiments to see how if we changed the conditions that the child is waiting under, that will affect or won't affect how long the child is able to wait. MISCHELWell, let me give you an example. We found, for example -- here's an illustration. The little girl is waiting with exactly the set up that we just talked about. They're exposed in front of her and she rings the bell within 60 seconds after a bit of a struggle. We run the same child again in a situation where we say to her before we leave the room, if you want to, when you want to you can make believe that it's not really there. You can make believe it's just a picture. You know what a picture is. And the little girl says to me, yes, it's something with a frame around it. MISCHELAnd I say to her, well, if you want to, when you want to, you can make believe it's just a picture. Put a frame around it in your head. And the child is able to wait 15 minutes. So what did we learn from that? We learned that the way in which the temptation is mentally represented makes a huge difference. That again you were talking earlier about how the hot brain, how the limbic system goes for the real thing. But when the real thing is transformed into something that's really psychologically distant, it's just the picture, it has a very different effect. MISCHEL...because we could understand that what we're able to do, whether we're four years old or whether we're 40 years old or 80 years old, we can transform mentally what the stimuli that are driving us are doing to us. I can think, for example, about the chocolate mousse not as a picture, that won't work for me, but I can imagine that a little cockroach in the kitchen of the restaurant, I won't go further, I won't go further but I think you've already lost your appetite. So suddenly the chocolate mousse is not longer my temptation. REHMNow here's an email from Eric who says, "I was wondering if any link was found with alcoholism or other addictions and the test subjects' original findings? MISCHELWell, in one of the follow-ups that we did fairly recently -- by fairly recently I mean about six years ago -- I worked my group which includes a large number of researchers. My closest colleague has been Luigi Schoder (sp?) at the University of Washington in Seattle, but it's a large team. And my team got together with a team of distinguished neuroscientists Ian Gotlib at Columbia -- excuse me, at Stanford, B. J. Casey at Columbia, a large team. MISCHELAnd together what we did was to invite the kids who had been the (word?) subjects originally when there were four or five to return to the Stanford campus to spend two or three days there. And now low and behold with the development of FMRI and brain scans, we were able to actually see what they do when they're confronted with various kinds of temptations while in an FMRI scanner and their brains are being scanned. REHMSo what kinds of temptations did you present them as adults? MISCHELIt's called a go-no-go test but I won't go into it. We don't have time for it. The point is the temptations were having to not press the go button when they saw attractive faces. REHMNot pressing the go button. MISCHEL...the go button. So they're pressing go, go, go, go, go on many, many faces. And when there's an especially attractive face they have to go no go. REHMAnd what did that tell you? MISCHELWell, the ones who were able to accurately do not go for the attractive faces, okay, were having much less activity in the areas of the brain that are connected to addiction. So in terms of your question about is there a difference in the addiction areas of the brain, there is a connection. When we look at the difference between the kids who were consistently high in delay of gratification over the life cause as opposed to those who were consistently low, we've more activity when they're aroused in the temptation and addiction areas of the brain. REHMSo were you showing -- I presume there were both men and women in this follow-up study. So were you showing the men just female faces and the women just male faces? MISCHELWe weren't doing that. We were doing it in a variety of order and so on. REHMOkay. And what else did you find out that differentiated these children in adulthood, the ones who were able to delay gratification? How are they different in adulthood from those who were not? MISCHELWell, for example, one very straightforward example that speaks to your question about temptation and addiction and so on is that there -- we found a relationship between seconds of waiting when the kids were four years old and their body mass index when they were between 27 and 32. So the body mass index is an indicator of the degree to which they were really becoming overweight. REHMSo that somehow that link between childhood and adulthood of resisting temptation held on through. MISCHELSo in order to explain this reasonably, I've got to take a couple of moments to explain a concept that is now called executive function or executive control, which is a very popular subject in cognitive neuroscience, people who study the brain because it turns out to be very important. And I think what we captured in the marshmallow test is a wonderful measure of executive function. What's executive function in terms of a marshmallow test? MISCHELSo I'm a four-year-old and I have to keep in mind a goal. That's the first thing in executive function, keep in mind a goal. And the goal is I'm waiting for the two marshmallows. Then I have to be able to inhibit interfering responses. REHMLike I'm dying to have that marshmallow now. REHMAnd self-control has to come in there as well. MISCHELExactly. And that's what self-control is, the set of skills that allow the child to essentially cool it. To allow the child to not focus on the yummy, chewy, I want it so much but to focus instead on things like the exploration of her nostrils and her ear canals so that she can toy with the product. It sounds a little disgusting but it's fine as a four-year-old, spending time distracting herself from the yummy, chewy marshmallow or singing little songs, this is my home in Redwood City. Or since it's California, knocking off her sandals and playing the piano on her toes. REHMAnd you're listening to "The Diane Rehm Show." Why did David Brooks write about this in terms of public policy? MISCHELWell, he came over to my house and we had a lovely hour or two. And he watched the videos, the real videos, not the ones on YouTube, but the videos that I could show him but don't show in public because of human subject confidentiality. MISCHELDon't want the children to be shown. And what he saw was exactly how executive function plays out at age four and five, namely kids doing this remarkable job of transforming a situation that would be, if it's normally so effortful that you can't do it, into a situation that's effortless. MISCHELAnd the brilliance of the kids who were doing this well was that they managed to do exactly that, that by transforming the object of desire into something that was further away, for instance, by physically pushing it away, by picking up the bell and examining it as if they were scientists without being terribly, terribly careful not to ring the thing, and by putting it as far as possible away from themselves and taking three minutes to do that, you know. REHMControlling our temper in relationships. MISCHELWell, one of the problems that creates problems in relationships is that people become angry at each other. And when they become angry, instead of cooling down the troubles begin and the explosive relationships are ready to occur. And as an example of psychological distancing used in dealing with emotional problems, one of the situations that's quite common in life is heartbreak, given how often divorce occurs, how often people abandon partners and so on even after years of committed relationship. MISCHELAnd it's very difficult for some people to overcome the experience of intense rejection of having really been dumped. So one of the things that my students and I have done, and a particular leader in this is someone called Ethan Cross, a former student of mine at Columbia and now a professor at the University of Michigan and Asla Maddock (sp?) who was a student at Columbia, is now a professor at UC Berkeley. MISCHELWell, we began together and now they're doing this in their own individual laboratories. And what we examined was the question, as people try to get over the depression and over the pain of a broken heart, they very frequently keep recounting the story and reliving it, telling it to friends, telling it to therapists. MISCHELAnd while this helps some people, there are lots of people for whom going over and asking them, why did it happen, why did it happen question from the immersed perspective, that is from your own eyes, don't help, It hurts. It actually makes it harder for the wounds to heal. It makes it harder to overcome the heartbreak. So the question that we ask is, what if one steps out of the self? Can you step out of the self and distance yourself as if you were a fly on the wall and listening to the story of the heartbreak? REHMAnd we'll take a little break before we hear the answer to that what if. Stay with us. We'll take your calls when we come back. REHMAnd as we talk about Walter Mischel's new book, "The Marshmallow Test: Mastering Self-Control." I do want to remind you you can see a video of a child taking an example, one example, not the precise marshmallow test, on our website. Go to drshow.org and you'll see what we've been talking about. Here's a tweet from Shelly, who says, since the first time I heard about this study, I've wondered, did any kids eat all three marshmallows after the researcher left? MISCHELIt's a wonderful question, and the answer is no. Not a single child, either in the marshmallow studies at Stanford, nor in studies that we did in the south Bronx of New York, when I came to New York, where we have done extensive studies with a very different socio-economic and ethnic group. Nor in Oakland, California. With one very important exception that occurred, actually, in a foreign country. I won't name the country. And what this child had done was to select not marshmallows, but Oreo cookies. MISCHELHe was six-years-old. Between five and six, probably closer to five. And what he did, masterfully, was to open each Oreo cookie, completely, cleanly, lick out the contents, that is, the creamy stuff, close the cookie systematically on each of the three. Very carefully replace it into the exact position from which he had taken it on the tray. And then strike a pose as if he were a method actor in which he dropped his innocent face into his hand and looked at the door expectantly. A picture of total innocence. MISCHELAnd when I describe that study at a university lecture at Columbia University, the provost at that time, it was 20 years ago, yelled out when he grows up, give this guy a scholarship. REHMJust wonderful. Here's another. This from Jake, who says, I have a one and two-year-old. What could I be doing to enhance these patience skills in my children? MISCHELExercising restraint so that the child is seeing how you're doing it. And a terrific way to exercise restraint is to find ways of distracting yourself from the temptation. Find ways, for example, if your child is having temper tantrums because his favorite program isn't on the television yet, one of the things that one parent found very helpful is to simply help the child, at that early age, to realize, if you start playing with your toys now, the time will go much faster. MISCHELAnd to have children understand that there are self-distraction strategies that they can use that will cool them down and that will allow them to do what the kids who were doing it so well in the Bing School did, which to distract themselves constructively to make the time pass faster. By doing things like playing with their toys while they're waiting for something to happen, whether it's dinner or and so on. REHMAll right. Let's open the phones now. 800-433-8850. Send us your email to drshow@wamu.org. First to Brian in Grand Rapids, Michigan. Hi. You're on the air. BRIANHi, Diane. And hello doctor. BRIANMy question is regarding tensions. In particular, the defined benefit versus a 401K. Which one holds the employees working longer, harder hours for fulfillment? And then conversely, the students in Hong Kong who are out there protesting for their freedom to choose their leaders. How long do they have to wait for their gratification? I mean, if you want something good to happen through your actions, how long do you have to wait? REHMWell, I'm not sure that Walter is going to be able to respond to that. However, as far as those young people in Hong Kong, how long do you think that their protest would continue if they had no response from the hierarchy? MISCHELI really think that's a question that I can't answer, because it so depends on the detail of the circumstances. And of that political situation. It really depends on how, you know, what the expectations are there and what the political situation is, and it's just out of my expertise. It's a good question, but one that I can't answer. REHMAll right. Let's go to Steve in Houston, Texas. Hi Steve. You're on the air. STEVEDiane, good morning, and thank you for taking my call. STEVEThis is the first time I've ever called in. I find this very interesting, Dr. Mischel. I'd like to share something that happened to me when I was four-years-old, maybe going on five-years-old. I'm now 63, but it's a situation that I've revisited many times throughout my life and thought about. I've never put any significance to it until listening to you. When -- what had happened was I wanted a raincoat. And there was a really nice raincoat. It was a bright yellow, heavy duty raincoat. And my mother said that we couldn't afford it right now. STEVEBut that if I wanted to get a transparent raincoat, a very, a flimsier one, then that one, she could get it for me right now. And if I would wait for, you know, two or three weeks or so, for the next pay day, she'd be able to get me the better yellow raincoat. Well, when I heard the offer, I was willing to wait for the yellow raincoat, except that there had been things my mother had done in the past that created a level of distrust. So I was thinking, you know, I may not get any raincoat if I try to wait two or three weeks. So I'd better go for the other one first. REHMAnd is that what you did? STEVEYes, ma'am. Miss Rehm, that's exactly what I did. And I regretted it, because that raincoat, that transparent raincoat, it was torn up in about a couple of weeks. REHMYeah, and that goes back to your earlier point about trust. REHMNow, I want to get in to the public policy realm of this. And again, David Brooks wrote about this in a column back in 2006 for the New York Times. Tell me what you see and what he saw as relevant to the wider public policy issues. MISCHELI think, in terms of the really important questions of public policy, the economic divide, and the large issues that confront us in education and in helping people who are at the bottom of the economic ladder to really have a chance to realistically climb up it, that there are enormous implications. And the implication is that the research clearly, of the last 30, 40 years, has made clear that we are not completely the victims of our genetics, that there is a great deal that we can do that will influence how our genes play out. MISCHELAnd that what we smoke and what we eat and how we think and the emotions we experience and how we live our lives have enormous influences on what we can make of our lives. That is, that we are -- can be active agents of our own lives to a much greater degree than had been believed when people thought, really, you either have it or you don't. And there's not much that you can do about it. The important thing to realize is that executive control, that is the ability to delay gratification, by keeping that delayed goal in mind, by inhibiting the interfering responses, and by using your intention flexibly, is something that can be taught. MISCHEL...over the cat as the cat is running all around. MISCHELThis is a wonderful example of teaching executive control. The kids were exposed to this for five days, exercises of this kind, and actually had very remarkable improvements in their executive control, as measured on a variety of tests that are used in brain research and so on. There was even some improvement in IQ points. And that's from five days of training in a very congenial to kids task. The public policy implications are that there are ways of enormously increasing the cognitive and the emotional skills that are necessary for people to exert self-control. To have control over their own negative emotions. To resist temptations if they want to resist them. REHMAnd you're talking there about drugs. You're talking about food. You're talking about killing somebody. MISCHELYeah. We're talking about the control of emotions that include violence. And one of the things that the south Bronx studies made very clear, and the book talks about in detail, is that even if we are disposed -- disposed, for example, towards being aggressive. That disposition will not play out in as extreme a way if we have self-control skills and the motivation to use them. So, to me, the most important message that comes out of the book is that self-control is teachable. MISCHELIs teachable in ways that range all the way from what Sesame Street is doing in the last two years, where we are trying very hard to help Cookie Monster join the cookie gourmet connoisseur club. By controlling his impulses a little bit, and so Cookie Monster is learning to put a frame around cookies in his head. REHMHave you been advising them? MISCHELI've been a consultant to the development of some of that. MISCHELAnd some of -- Sesame Street is a very good example. MISCHELThe kids' schools in New York are another excellent example. REHMAnd Mister Rogers was a fabulous example. MISCHELAnd Mister Rogers was a fabulous example, as you say. MISCHELSo, there are excellent illustrations of how self-control can be incorporated into the curriculum, beginning in pre-school. REHMAnd you're listening to "The Diane Rehm Show." So, what you're saying is that mastering self-control begins in the earliest stages of childhood and has implications far into our adult lives. MISCHELAbsolutely. But it's not signed, sealed and delivered, even in early childhood. It can still be changed and influenced in adolescence, and even years later. There are all kinds of strategies that include, for example, mindful meditation, that adults have found very helpful in increasing their self-control abilities. REHMAll right. Let me give you an example. A teenager who has begun eating, really overeating. Teenagers can be difficult to get through to, perhaps more so than a four or five-year-old. What would you say to the child, a 14, 15-year-old him or herself, or that child's parent? MISCHELI mean, I think the first thing that is essential is that even if you have good self-control skills, or even if you learn self-control skills, unless you have the motivation, unless you have the burning goal not to eat everything under the sun or not to smoke everything under the sun, unless that motivation is there, the skills are not going to do it for you. So, to achieve the kind of change you're talking about in a teenager requires, first of all, engaging that child's motivation, that adolescent's motivation. MISCHELOne way to do that is to call, really, very vividly, via the hot system, attention to the long term consequences of carrying on as he's doing. That is, for the child to realize, I'm really messing up my future. I'm really behaving in a way that future is going to be wrecked, unless I change. And he has to believe that there is that future. MISCHELHe has to actually believe that there is that future for him. That means he has to have experiences in which he, first of all, recognizes that what I do has consequences. Many kids grow up in environments where there's very little clear relationship between their behavior and the consequences they get. REHMAnd what about the adult smoker who says, you know, I'm going to die in one way or another anyhow. What difference does it make? MISCHELWell, I mean, I was an adult smoker in the early 1960s and I was smoking three packs a day, and I was ignoring the Surgeon General's reports, which were starting to come out. For the cool system, about the abstract consequences of smoking. Until I had an experience where I wandered through the hallways of the Stanford Medical School and saw a person, a man with his arms stretched out, his chest bare, his head shaved, and little green x marks all over his body. MISCHELAnd I asked the nurse what is happening with this person, and she said, oh, he's got metastasized lung cancer and he's going for his radiation treatment. And those green Xs mark where the radiation goes. I couldn't shake that image, and that made the delayed consequences very vivid for me. REHMWalter Mischel. His new book is titled, "The Marshmallow Test: Mastering Self-Control." I'm going to work on it. REHMThank you for being here. And thanks, all, for listening. I'm Diane Rehm.